The true story behind Yogi Bhajan's gora kundalini yoga (white Sikhs )! 28. It was during this trip to India that defendants claim that I took Sikh vows. It is true that I participated in a ceremony, which Bhajan orchestrated, at the temple at Amritsar. However, at that time, I understood very little about the Sikh religion, or what the import of the ceremony might be. I did not make a decision that I wanted to become a Sikh or to take Sikh vows prior to going out to the temple or prior to taking the trip to India. 29. This was one of many instances, like the abortion related above, in which I did not choose my conduct or the way I wished to proceed with my life. Bhajan made the choice of what my action would be, and presented it to me as decided. 30. 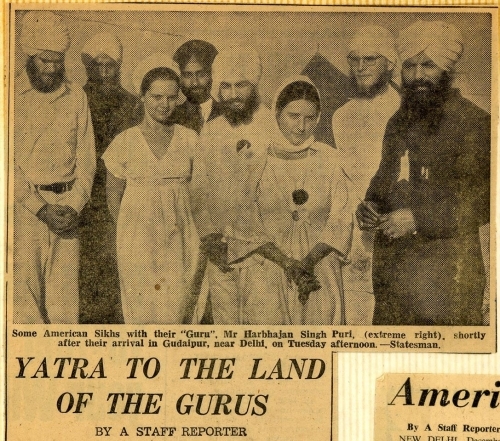 All of us who were on the trip to Amritsar in 1970-1971 participated in what defendants call taking Sikh vows. I participated in the ceremony because Bhajan told me it was special, and he wanted me to do it. I had no independent recognition of the ceremony as a religious ceremony, nor did I know what place, if any, the ceremony had in the Sikh religion. students." Here are some of the scenes which have left a deep impression on my mind. think Sikh baptism was ever made such a mockery and empty ritual." Sikhs are encouraged to write Yogi Bhajan's Sikh Dharma on their fb page at this link and insist they tell the truth and stop propagating frauds against the Sikh religion.